ON THE OCCASION OF THE 100TH ANNIVERSARY OF KARL ABARTH’S BIRTH There are names that alone express concepts, lifestyles and philosophies better than any lengthy explanation. That Abarth is one of these is a conviction by no means restricted to expert writers or specialist journalists. In the case of Abarth, perceived by enthusiasts as a synonym of performance, speed, agility and emotions, confirmation has been provided by the Fiat Group’s extensive research ahead of the major relaunch of the Scorpion marque. Given the current situation, with the new Abarths returning to the road ready to “sting”, it is an ideal time for this book that sets out to reconstruct the story that led to the birth of a legend. Subdivided model by model, the text is based on straightforward, effective descriptions, backed up by contemporary photos in black and white and colour. 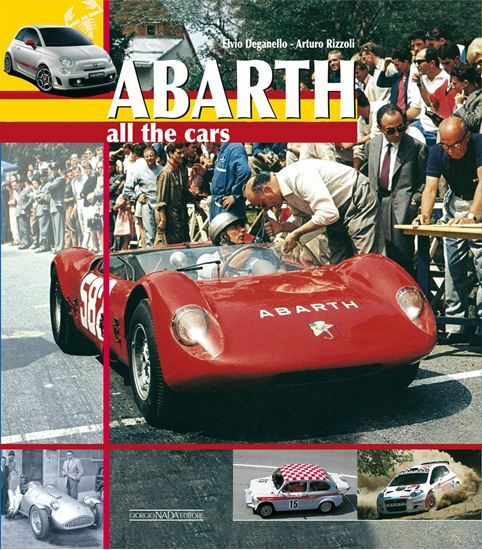 The author has successfully illustrated the motivations that led Carlo Abarth to create something unique in the automotive world, at the cost of sacrifices, failures and disappointments such as the numerous custom models built in the early years.